The Gamma Gamma Chapter of Pi Kappa Phi is recognized by the University as the first Greek Organization at Troy University, its heritage goes back as far as 1963 when Charles Kendrick (Lambda Chapter – Univ. of GA) transferred to Troy State College. Mr. Kendrick met several students such as John Butler, Paul Nix, Driscoll Colquitt and Bill McCartney to name just a few. After much discussion, it was decided that they would form the first Greek Organization at Troy State College under the name of Pi Kappa Phi. This was no easy task. This group of men began the yearlong battle to break the barrier of non-Greek organizations at Troy State College. Their undying efforts led to the establishment of the first Greek Organization at Troy known as the “Kappa Phi” colony of Troy State College in late 1964. One month later on December 6th , 1964 , the Kappa Phi Colony at Troy State College, initiated 24 men into the first fully organized social fraternity at Troy State University. Two years later in April of 1966, the “Gamma Gamma” Chapter of Pi Kappa Phi at Troy State College was founded. The non-Greek barrier was broken and the first Greek organizations were finally allowed on campus. Today “Gamma Gamma” has initiated over 1,000 brothers into our Fraternity. Pi Kappa Phi has a long history when it comes to places of meetings and homes. The first meeting place established by the Colony was in the Branding Iron restaurant located in a motel just off of Hwy 231. The brothers rented the office space and meeting room. This was primarily used for chapter meetings but also was used to have social events. This was used extensively to coordinate and execute the new Greek System at Troy State College. The men of Pi Kappa Phi then moved to their first fraternity house located on South 3 Notch St near the intersections of Hwy 231 in 1965 until 1966. This first Gamma Gamma house was destroyed long ago and has been replaced by a CVS Pharmacy. The house consisted of a large Chapter Room, a small apartment and large room in the back used for social events. The first resident members were Jim Clayton #4 and Max Scroggin #12. Under the direction of Jim and Max, the back room was painted black with a Jungle theme. A corner stage, for Bands and DJ, plants and strobes were installed. This is the birthplace for Gamma Gamma’s traditional Jungle Party held every spring semester. A portrait of this home can be seen hanging in the current house in memory of those before us. Party room of first fraternity house on Brundige St.
Pi Kappa Phi at Troy has also made the National Historical Records in the area of Housing. Pi Kappa Phi Properties held its first meeting in Troy, AL. 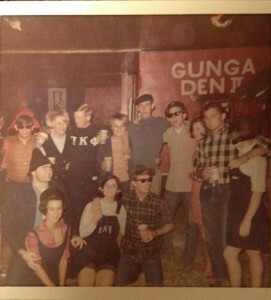 In addition, the Gamma Gamma Chapter was the first house (purchased on North Three Notch St.) by Pi Kappa Phi Properties in 1968. North Three Notch St became known as Greek Row due to so many fraternity houses being on this block. This was the second house the Gamma Gamma Chapter would call its home during its long history. Unfortunately, this home was lost to us in 1978 during a tragic house fire. Gamma Gamma’s third home was also located on 610 NorthThree Notch St (first Greek Row) and was purchased from the Tau Kappa Epsilon (TKE). Much work was done during to summer of 1980 in preparation for the Fall Semester. It was considered one of the largest self-help restoration projects in our history. The first pledge member class was initiated in early January 1980. In addition, this home was owned by the Gamma Gamma Alumni. This was the home of Gamma Gamma until the Fall of 1995 when the required renovations were cost prohibitive. In the late 80’s to the early 90’s, Troy State University began building the new fraternity row on Pell St. These were better known as lodges and were one-story buildings including several dorm rooms and one large party/chapter room. The men of Pi Kappa Phi elected at this time to remain off campus. The fraternity moved to 500 N. Three Notch in the fall of 1996, welcoming 18 new associate members as its first class to call it theirs. 500 North Three Notch was previously the home of another fraternity (Delta Chi) which resulted in those same brothers spending countless hours cleaning and scrubbing away the remnants of those that used to call it home. Though alumni initially lamented the idea that 500 North Three Notch once housed their rivals, it soon became loved like the rest before it. 500 North Three Notch served as a “home away from home” for over 150 brothers until 2003 when it finally succumbed to the elements — no longer safe for its inhabitants. Pi Kappa Phi soon became the last fraternity on North Three Notch St and the only fraternity off campus. The Gamma Gamma LLC (GG LLC) was formed in 2005 and led to the purchase of the apartment complex on top of the hill near the lake on campus. A party barn and decking was added which greatly assisted the chapter with its social events and meetings. This was considered the chapter’s home until the Spring of 2010. In the summer of 2009, Troy University broke ground on the new Fraternity Village. The University determined that the fraternity’s choice of lot would be determined by time on campus. Pi Kappa Phi had the first choice in their new home’s location. The GG LLC sold the apartment complex to the University and used those funds to commit Pi Kappa Phi to move “On Campus” for the first time since its beginning in 1964. Pi Kappa Phi has a proud history and has always adapted to unexpected changes. We are proud of those men that have made our chapter what it is today.